Thank you for being such a wonderful class, it has been a privilege teaching you. Don’t tell my other classes, but you were my favorite. We will go over the final type books, which are due next week before the final. We will also review materials for the final exam. Putting It All Together: Students create a 1 page document. Students combine all elements discuss during semester to create a 1 page poster. This poster should display proper use of type, variations in type, visual hierarchy, and legibility issues. 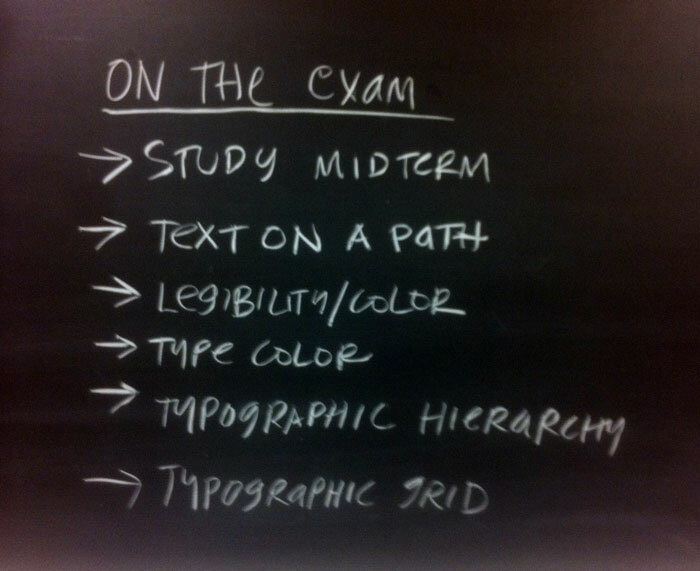 Here is the class template for today’s work. Here is a presentation on posters for today. OK, the type books are due–I will show you what you need to do. Be sure to study for the final–I will cover what will be on it in class and list it here. Today, you will have Marianna again as a sub as I am at Methodist becoming a mom! Woo hoo! For these layouts each students uses just boxes- not actual text. Instructor will select one of these layouts and then actual text will be positioned. Student will create layout using the sketch chosen by instructor in class. Here is the presentation on Typographic Hierarchy. Here is the class template and text for the exercise. We will discuss hierarchy in class, as well as the parts of the grid. We will also begin a discussion of combining typefaces. Turn in all late work! You need to catch up on all Type Book assignments. I will post a list of all assignments due up until now with a pdf of the handouts. Be ready for a small quiz next week on all we covered since the midterm. We are going to have a short quiz next week–the storm knocked us off course and I need to get us back on, so my apologies for this coming so soon after the midterm. Here is the lecture presentation. Using the path tool in InDesign and some of the lyrics from your favorite song, construct a multi-page composition for your type book. This needs to be at least four pages, and you should use the typefaces you choose and the structure of the lines you draw to support and emphasize the meaning of the words. Remember that the pages form a larger whole, so the text should flow from one page to another. Be aware of spacing between words and letters, and pay attention to the mix of typefaces: a good thing to do is to make sure they all have a similar x-height, even if that means you have to use different sizes of type on the same line. Columns 1-4: Use this area as your main composition area. Column 5: The label should read Text on a Path and then list the group and song title. You may use fonts the Lost Type Coop or Font Squirrel as you see fit.